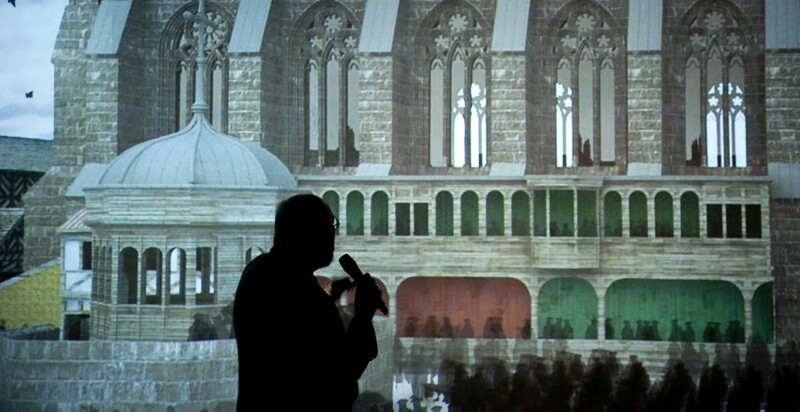 John Schofield, Archaeologist, St Paul’s Cathedral, London, discusses the model of St Paul’s and early modern London, Tuesday, November 5th, 2013, in the James B Hunt Library, NC State University. The Virtual Paul’s Cross Project Installation in the Teaching and Visualization Lab of the James B Hunt Library on NC State University’s Centennial Campus opened on Tuesday, November 5, 2013 at 10:00 am, the 391st anniversary of John Donne’s sermon for Paul’s Cross on Tuesday, November 5th, 1622. John N Wall discusses the Paul’s Cross Installation in the Teaching and Visualization Lab of NC State’s James B Hunt Library, Tuesday, November 5th, 2013. For media coverage of the Opening Ceremonies, go here and here. The heart of the Installation is a 6 minute video of the Visual Model of Paul’s Cross. To see this video, go HERE. 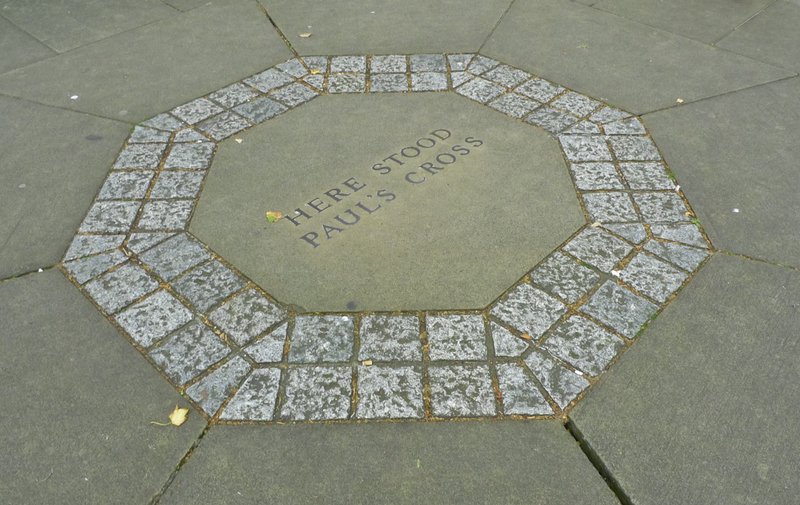 We begin each demonstration of the Installation by showing this image of how the east end of Paul’s Churchyard, in London, looked in early September of 2013. This part of today’s London is a retreat from the hustle of commercial and legal London just outside the Churchyard. We then notice the arrangement of stones just north of the northeast corner of Wren’s cathedral, with this inscription in the middle. This is the only reminder in the Churchyard that 400 years ago this space was not a retreat, but a space — the largest open space in early modern London — at the heart of religious and commercial London. But if we could step back, over the intervening years, to Paul’s Churchyard, on November 5th, 1622, this same view might have looked something like this. While Paul’s Churchyard today is a park, Paul’s Churchyard in 1622 was at the heart of a busy commercial district. Paul’s Churchyard in 1622 was an active burial ground, the center of the English book trade, surrounded by mixed use buildings with book sellers’ shops on the ground floor and living space above, and the space through which Londoners in large numbers moved on their way from the space to the south of St Paul’s to the space to the north. Their movement was facilitated by a passageway through the nave that ran from north to south. Access from one side of St Paul’s to the other today is impeded by the absence of any such passageway, with access to the interior essentially limited to the west end. Paul’s Churchyard was the obvious choice to site an outdoor pulpit. The space in front and to the sides of the Paul’s Cross Preaching Station could hold as many as 5000 or 6000 people. Thanks to the acoustic properties of this space, a preacher with basic skills in public speaking could be heard anywhere in the Churchyard, so long as he had the attention of the crowd. 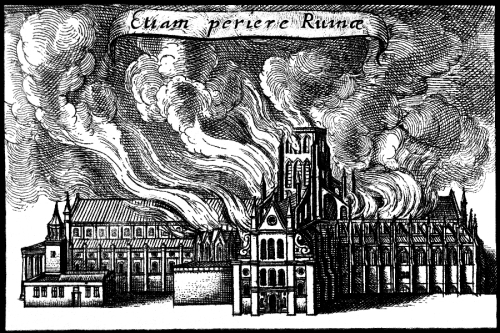 That time is separated from St Paul’s and Paul’s Churchyard by 400 years of change, but especially by one significant event, the Great Fire of London, which broke out in a bakery in Pudding Lane in the early hours of Sunday, 2 September, spread rapidly through the City of London, reaching and destroying St Paul’s on Tuesday, 4 September, before burning itself out on Wednesday, 5 September 1666.